Introducing Marketing's morning briefing, a daily shot of news and a recap of the best longer reads and videos. Today we look at Apple's u-turn over royalty pay and Tesco's continuing woes. Apple Music has surrendered to the might of celebrity brand after Taylor Swift refused to allow the company to stream her album 1989 because she would not be paid royalties. Apple said it will now pay artists for music streamed during a free three-month trial service, currently offered to prospective subscribers. Swift wrote an open letter, which she posted on Tumblr, describing Apple's policy of paying nothing to artists as "‘shocking, disappointing and completely unlike this historically progressive and generous company". Tesco is set to announce a fall in like-for-like sales of 2%-3% for the last quarter, while shareholders are reportedly angry at executive pay packages. The Tesco board, under chief executive Dave Lewis - whose turnaround plans have so far led to no improvement in Tesco’s business performance - will come face to face with investors at its AGM this Friday. With the Internet of Things becoming an everyday reality, Andrew Buckman, MD, EMEA at OpenX argues that it is the future of advertising. 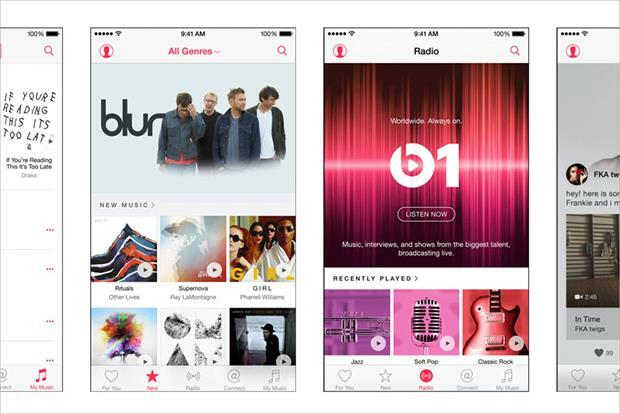 Apple Music - is it a case of too little, too late?